Claggett Creek football got its storybook ending. 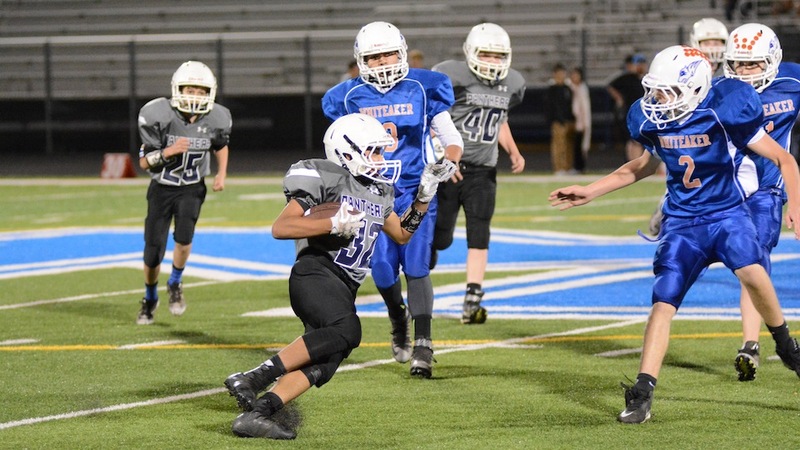 All tied with nine seconds remaining, running back Aron Montoya found a hole and out-ran the Whiteaker defense for a 60-yard touchdown as the Panthers won the battle of Keizer middle schools 44-38 on Wednesday, Nov. 1 under the lights at McNary High School. “You can’t really ask for a better ending for all the hard work,” CCMS head coach Aaron Carr said. Trailing 38-22 with 33 seconds remaining in the third quarter, Whiteaker had to score two touchdowns and convert two 2-point conversions to even tie the game. Axel Zapien, in his first game back after suffering an injury at the start of the season, broke free for a 59-yard touchdown run and then also ran in the 2-point attempt to get the Wolverines within 38-30. After getting a stop on defense, Whiteaker then went on an 11-play, 58-yard drive, capped off by a Carson Long 1-yard touchdown run to make the score 38-36 with 18 seconds remaining in the game. Zapien then added another 2-point conversion to tie it. When Whiteaker defensive lineman Laz Chavez then sacked CCMS quarterback Nathan Allen, the game appeared to be heading to overtime. However, Montoya had other plans. “He’s got the ability to put it in the end zone from anywhere on the field,” Carr said. The game-winning score was Montoya’s third touchdown of the game. The first came on a 28-yard run to give the Panthers an 8-0 lead with 2:16 remaining in the first quarter. Rudy Garcia, Claggett’s power back, then added a 9-yard touchdown run to stretch the lead to 14-0 with 7:22 remaining in the second quarter. Long gave Whiteaker a spark with 5:20 left to play, returning an interception 80 yards for a touchdown. After CCMS receiver Evan Cornell caught a 55-yard touchdown pass over a Wolverine defender, Long answered with a one-handed grab on the sideline for a 26-yard gain and then broke a tackle for a 7-yard touchdown to get Whiteaker within 20-14 with 10 seconds remaining in the first half. Cornell scored a 28-yard touchdown on a reverse and Montoya added a 20-yard touchdown run to stretch Claggett’s lead to 32-14. But Whiteaker kept fighting as Zapien got around the edge of the Panther defense for a 50-yard run and then Long capped the scoring drive with a 1-yard touchdown run to keep the game within reach. “These kids love each other on this team and it matters when your teammates want you to succeed and you saw it out of these kids, they want it so badly for each other,” Larimer said. After the game, McNary football coaches spoke to players on both teams. Claggett Creek also won the JV football game earlier in the day, defeating Whiteaker 28-16.